Do you want to eliminate the strain from lifting heavy objects? If so, the battery powered electric fork stacker with adjustable from Wesco is the solution! The battery powered stacker provides propulsion as well as lift. With the help of the power propulsion system, you only need less effort in moving heavy loads. 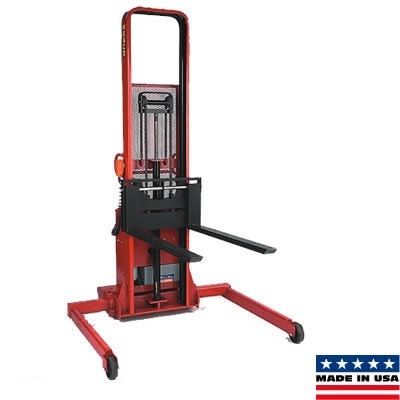 This high-capacity electric fork stacker is available in various sizes and has a maximum load capacity of 2000 lbs. It also has up to 104” lift height with dual chain lift. There are also features to make all your heavy tasks more efficient and hassle-free. The stacker comes with remote control with 12-foot coiled cord. This remote control allows the operator to stand on either side of the unit for the most convenient position. Furthermore, this remote control has magnetic backing, allowing it to be conveniently stored anywhere on the unit for easy access. The illuminated voltmeter serves as battery status indicator. Moreover, it comes with 12-volt battery charger and two maintenance-free batteries. You may also use the unit while charging provided that there is sufficient power. Are you having problems handling stackers in confined spaces? The power drive models feature the finger-tip controls for precise maneuverability in tight corners. The steering wheel, load wheels, and the drive wheel are all made of polyurethane ensuring smooth steering and durability. Safety is a major priority with these Wesco electric fork stackers. The red emergency stop switch can automatically reverse the direction of the unit when it comes into contact with an obstacle. There is also the dead man break and standard floor lock to keep the unit steady while loading and unloading. With 2000-lb load capcity, the battery powered Wesco electric fork stacker is the perfect solution for moving all your heavy loads. Say goodbye to back pains forever! Order your own stacker through the Buy Now button.